I could get really technical with this recipe but I’m not going to. At least not today. No, today I’m going to show you my basic recipe that also happens to be quite good. If I were making this the way I used to in my days of competition barbecue, I’d be using about six different types of chilli powder. Each would play a major roll in making this the award winning dish it was. That and the magnificent flavour you get from slow cooking the chilli for hours in hickory smoke. This version, though similar can be made in your home kitchen. Let’s just say I’ve never had any complaints. 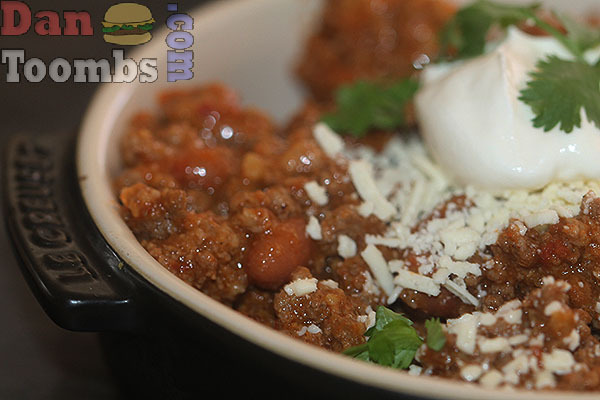 Every time I make a big pot of this chilli it all goes, right down to the last bean. 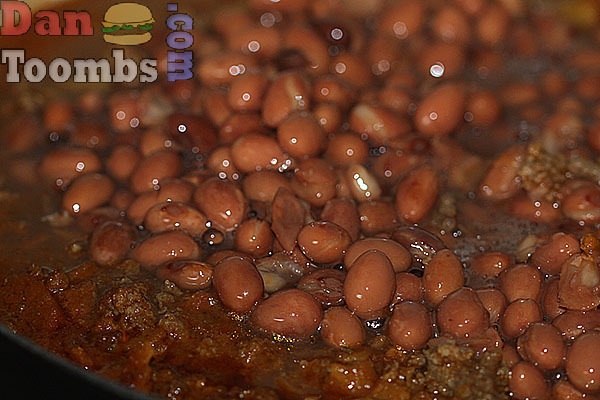 When making chilli, I always use pinto beans that have been soaked overnight and then slow cooked until tender. The cooking broth adds so much to the flavour. You could of course use tinned kidney beans like so many chefs do but personally I think kidney beans are better used in other recipes. You will also notice the use of achiote (annatto) seeds which are not easy to find in the UK. Achiote isn’t an essential ingredient but definitely worth sourcing. It adds a deep red colour and a delicious flavour to the chilli. Look online and you will find! 3 (or more) green chillies such as jalapeños. I usually cook the meat separately first. This way you can break it all up while it cooks so there are no big pieces. 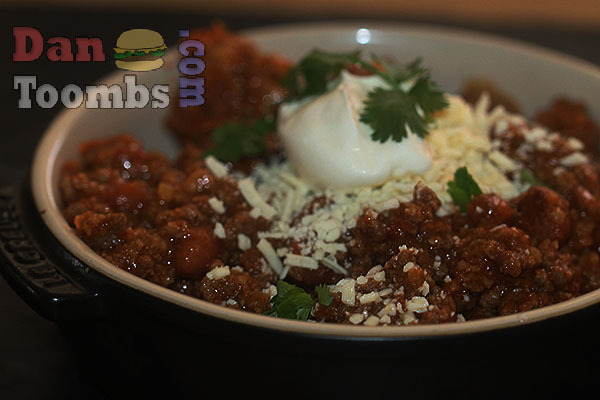 Fry the meat and set aside in a bowl while you make the chilli. To cook the sauce, start by making your achiote paste. Grind 2 tablespoons of achiote seeds to a fine powder using a pestle and mortar or spice grinder. 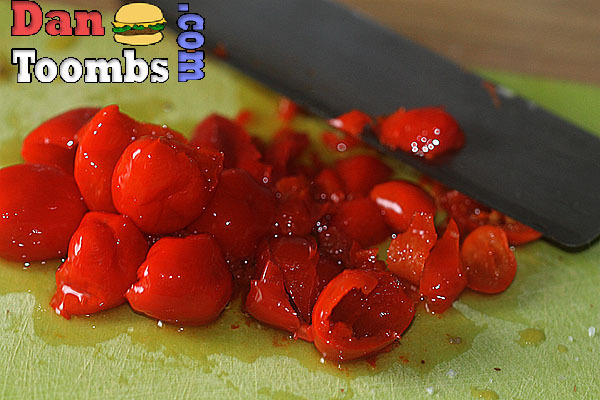 Add the garlic and peppadew chillies and blend into a paste. You may need to add a little water. Now fry the onions in the olive oil until soft and translucent. Add the achiote paste to the onions and stir it all up. 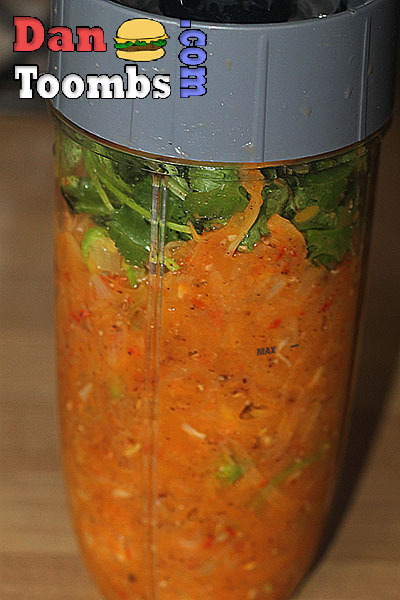 Add the green chillies and about 400ml of the chopped tomatoes. 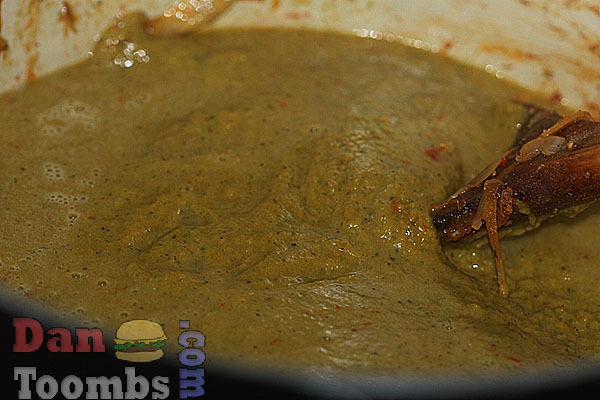 Fry for a further minute and then remove from the pan and blend with a large bunch of coriander until smooth. Return this smooth onion mixture to the pan and cook over medium high heat for another couple of minutes. 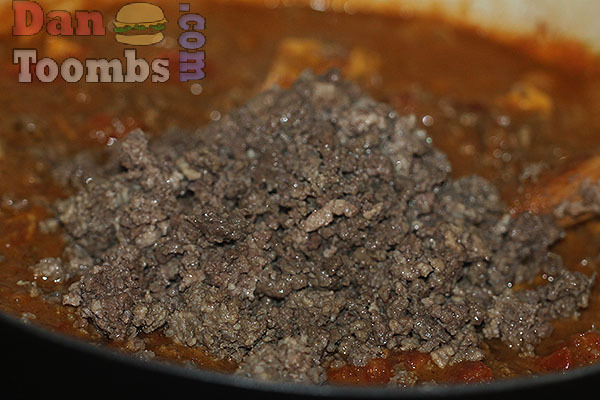 Throw in the bay leaves and the rest of the chopped tomatoes along with the ground spices and chipotle paste. Then toss in a couple handfuls of corn chips. Stir this all up. 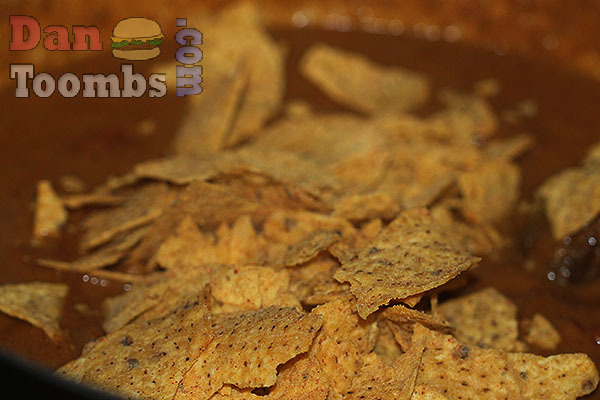 The corn chips will break down and become part of the sauce. 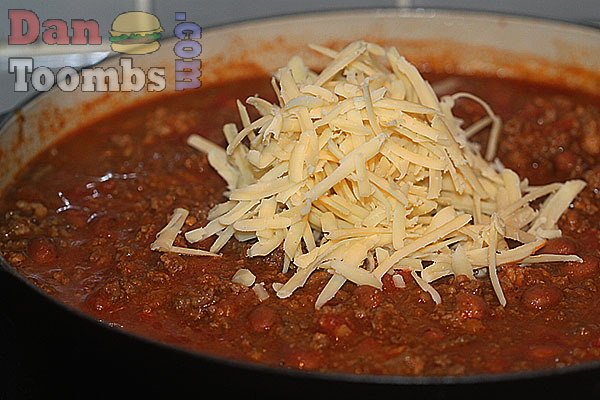 Add the meat, beans and two large handfuls of Cheddar cheese and stir to combine. 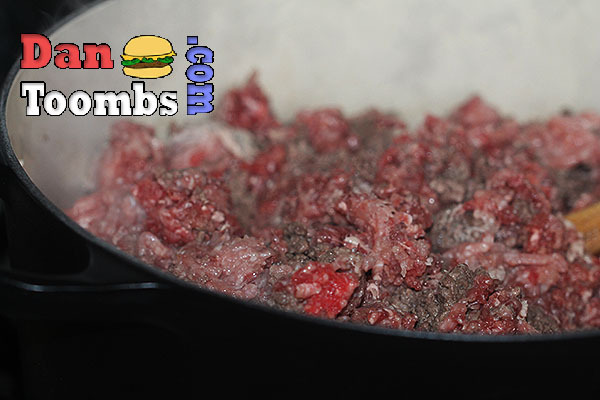 Allow to simmer over low heat for about an hour or longer. Cook the meat first so that you can break it all down. Pour the blended paste back into the pan. 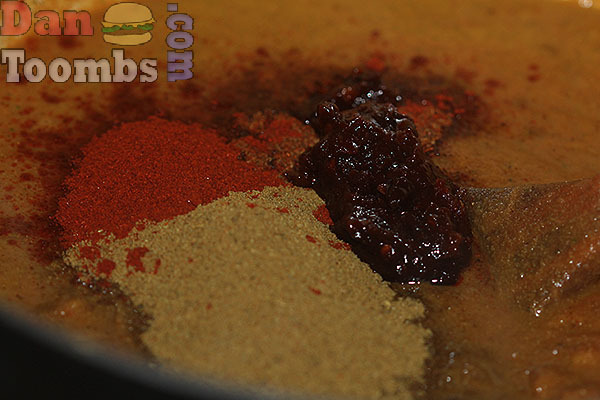 Stir in the chopped tomatoes and add the cumin, chilli powder, paprika and chipotle chilli paste. Now stir in all that beef and pork you fried. Add the cooked beans and a little of their broth. Top with sour cream, cheese and coriander and dig in. Many thanks to Dan for the recipe.